Hello and welcome to our newsletter! Find out how to draw dogs from a photo and easily create dog sketches. Pictures of whippets to download for your projects. You'll find here quality whippet photos you can use for magnets, t-shirts and stickers. Discover the Bedlington Whippet mix, an intelligent, high energy, trainable, medium sized lurcher. 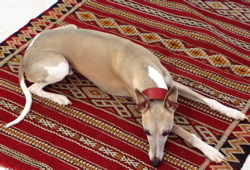 Looking for whippet dogs for sale? Find out where to start your search for a dog for sale. Read and post news about whippet rescue, litters of puppies, whippet meetings and announcements related to whippets. You have seen this many times; soft, liquidy poop found in a pile on the rug under the kitchen table. In this article I am going to go over the common causes of dog diarrhea, and how it is diagnosed based on the clinical signs. Lastly you will see the more common and most effective at home remedies to be able to stop your dog's diarrhea fast. Anything that upsets the digestive tract and results in water not being absorbed produces diarrhea. Some common causes include dietary indiscretion (eating compost), parasites (Giardia or Roundworms), food allergy, infectious causes (Salmonella), inflammatory changes (Inflammatory Bowel Disease; similar to Crohn's disease in people), and pancreatic abnormalities (Pancreatic insufficiency, common in German Shepherds). Probiotics help restore the natural bacteria in the intestine, normalizing the intestinal immune system. The most effective supplement is Lactobacillus acidophilus - give 1/4 capsule per 10 lbs of body weight twice daily. I advise probiotics for all cases of diarrhea, but purchase them from a reputable source to ensure the probiotics are active. Pepto-Bismol is an old standby that can be effective for dogs. The dog dose is 1 ml/10 lbs of body weight given three times daily for no more than 7 days. Imodium (Loperamide) can be used with care, avoid giving it to Collie's or Collie crosses. The dose for dogs is 0.5 mg/10 lbs three times daily (give your 40 lb dog one 2 mg tablet three times daily). One homeopathic in particular stands out as being especially useful for most cases of diarrhea in dogs. It is called Arsenicum Album, and is my preferred homeopathic remedy for dogs with 'Garbage Gut'. Dose: 1 30C tab per 20lbs every 2-4 hours. You now should have a good understanding of what the signs and symptoms of dog diarrhea. You should be able to differentiate between large and small bowel diarrhea, and now know when to seek urgent veterinary care, or try some of my suggested home remedies. Now you have a selection of home remedies to use the next time your dog gets diarrhea, and you can now stop your dog's diarrhea fast at home.